In this section we show techniques and examples of how to plan and execute effective integrated marketing campaigns to attract more people to your sites or engage with your brand. Our collection of resources to help you plan marketing campaigns. Signed-in members can check off those they have reviewed. ˜If you build it, they will come". This famous line proved true in the 1989 film Field of Dreams, but unfortunately, it doesn't apply to gaining sales whether they're via you desktop site, mobile site, social media presence or offline channels. If you want to maximize reach of online campaigns and to acquire new customers online you have to work hard to master the full range of RELEVANT online and offline marketing communications tools or digital media channels. 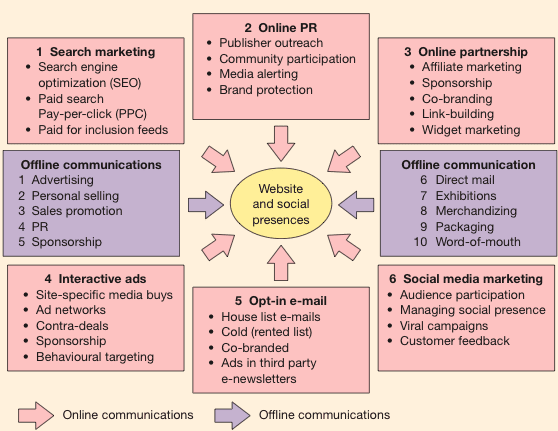 To review the approaches relevant to you we recommend you review the 6 tools summarised in the diagram from Dave Chaffey's and Fiona Ellis Chadwick's Digital Marketing:Strategy Development and Practice Book which are available in our advice on how to build your reach online. The starting point in improving your traffic for existing companies is reviewing your current mix of traffic using the standard last-click approach. If you're investing a large amount in media and have a complex product involving multiple touchpoints and visits to your site then media attribution will be important. A campaign plan should be structured around these six areas. If you're looking for a template to structure yours, see our Word campaign planning template. 1. Goal setting and tracking – which specific goals should be set for online campaigns and how do we measure success? What response mechanisms will be most effective? 2 Campaign insight – which data about customer and competitor behaviour is available to inform our campaign? 3. Segmentation and targeting – how can we target and reach our different audiences? 4. Offer and message development – how do we specify our offer and key messages? 5. Budgeting and selecting the digital media mix – how should we set the budget and invest in different forms of digital media? 6. Integration into overall media schedule or plan – how should we plan the media schedule which incorporates different waves of online and offline communications? Integrated campaign planning involves selecting the right mix of these marketing tools or channels to reach and influence your audience and so meet your campaign objectives. We define the 6 key online channels you should. But first, you need the right campaign concept which will engage your audience and be shareable. This chart from the traffic mix post above shows a typical referrers from sites using Google Analytics. How does your compare? Do you have email and display campaigns tagged separately? What is the most effective marketing technique in 2011? Brand Republic - A traditional marketing magazine with the online portal covering digital marketing campaigns well in different channels and its Wall Digital Marketing Blog.